Goddess Lakshmi, wife of Lord Vishnu, in Hinduism is symbolic of wealth, prosperity, love and beauty. Said to rid problems of money and fortune, Goddess Lakshmi is endowed with six auspicious and divine qualities, or Gunas. Believed to be the Mother of the Universe, she is the supreme embodiment of beauty and spirituality. She is worshiped in homes and business establishments to bring in wealth and fortune. The auspicious festival of Diwali is celebrated in honor of Goddess Lakshmi. People decorate their homes with oil lamps, candles and colorful rangoli. Special puja takes place known as the “Lakshmi Puja” and the doors are left open to facilitate her entry. An interesting tradition related to Lakshmi Puja is that of drawing the footprints or Shripada of Goddess Lakshmi on the thresholds of the houses. These are drawn pointing inwards symbolizing Lakshmi entering the home and staying there forever. 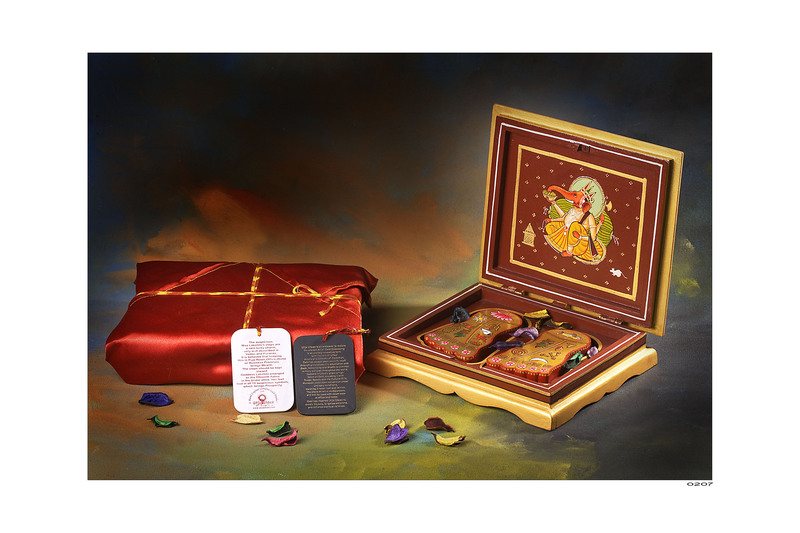 Urja Utsav bring to you beautiful Ma Lakshmi’s footsteps, gold embossed with 15 auspicious symbols. You can keep them at your home, office or puja room. A wonderful gift idea for this Diwali, make sure to bring home the blessings of Goddess Lakshmi with these virtuous footsteps. For orders & inquiries about sizes and prices, please call us at +91-9413335533, email at urjautsav@gmail.com or simply drop us a message.